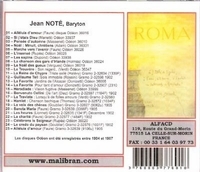 "Noté had a huge repertoire. He was especially admired as a Wagnerian and was the first to sing several Wagner rôles in France....he recorded many obscure pieces, which the Serious Collector should welcome. Note the selections by Auber, Halévy, Saint-Saëns, Diaz de la Pena, de Lara, and Hüe....for those interested in things historical, the record is indispensable." “After studying at the Ghent Conservatory, Jean Noté made his concert début in 1883; his opera début followed in Lille in 1885. Noté sang for several years in the provinces, then won a contract with the Paris Opéra, where he made his début in the spring of 1893, in the title role of RIGOLETTO. For the next twenty-nine years, he was a versatile pillar of that company. On 31 May 1904, he sang the Comte de Luna at the Palais Garnier premiere of LE TROUVÈRE.